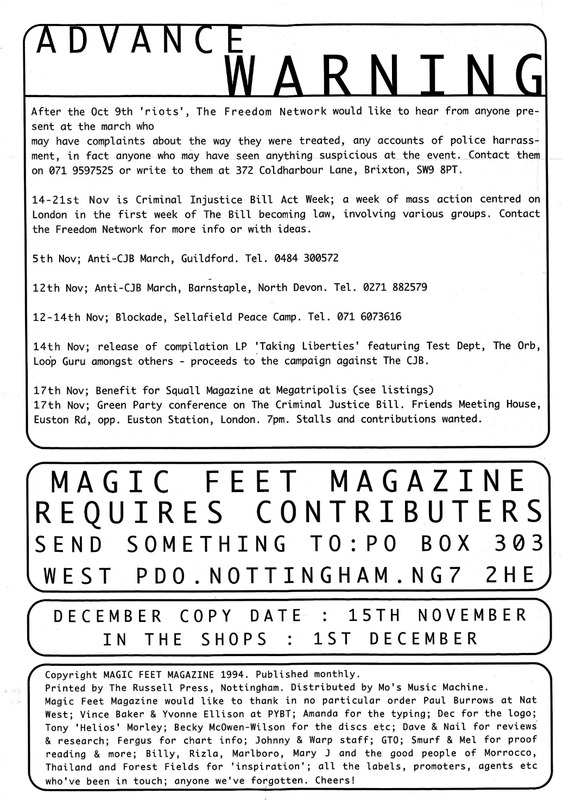 'Magic Feet' was a 1990s Nottingham-based dance music zine. Here's the front and back cover of the first issue from November 1994 promising 'hard house, ambient, electronic, acid, trance, techno, whatever you want to call it', and featuring Stefan Robbers, Innersphere and Warp/GTO charts. 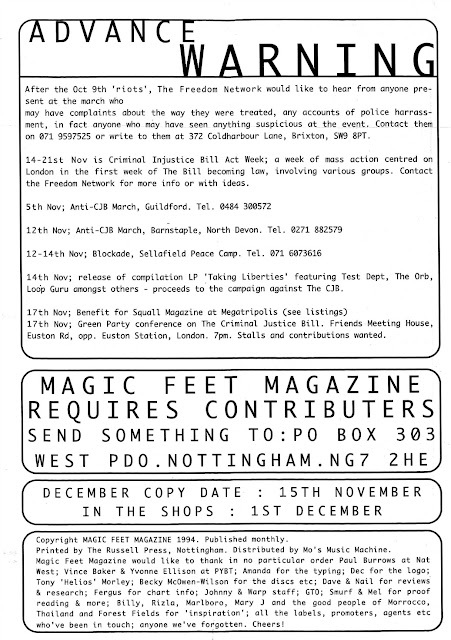 The back page includes an article from the Brixton-based Freedom Network about the then ongoing campaign against the Criminal Justice Bill and its 'anti-rave' powers. A demonstration in London's Hyde Park in the previous month- on October 9th 1994 - had ended in clashes with the police and the article calls for witnesses to come forward. Forthcoming events mentioned include more Anti-CJB actions in Guildford, Barnstaple and elsewhere, the launch of the 'Taking Liberties' compilation (an anti-CJB LP featuring Test Dept, The Orb, Loop Guru and others) and a benefit for Squall magazine at Megatripolis - the alternative techno/trance club held in London on Thursday nights. I think I went to that night, anyway I remember seeing a film/talk about the Newbury road protest in the somewhat incongruous setting of a banging Thursday night in Heaven. 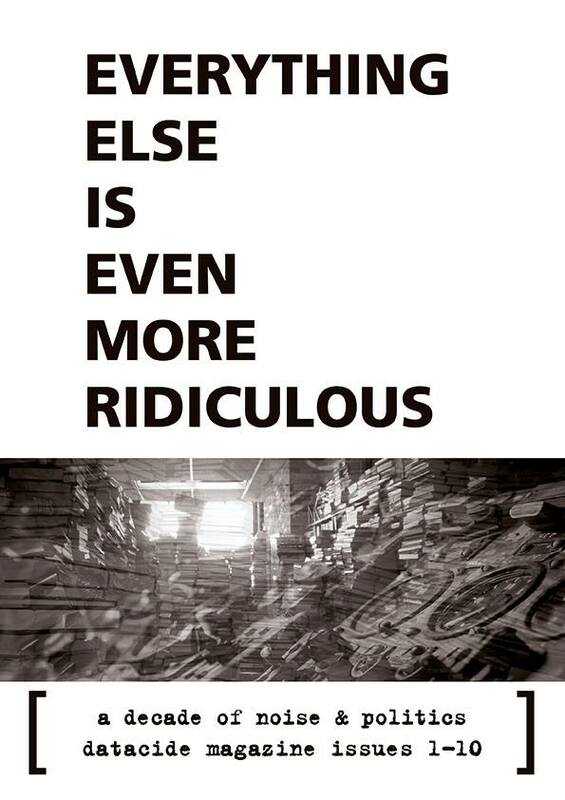 This Friday (23 October) I will be saying a few words at the launch of the new Datacide book, Everything Else is Even More Ridiculous, which brings together the first 10 issues of the noise and politics zine published between 1997 and 2008. It takes place at Housmans bookshop, 5 Caledonian Road, London N1 (round the corner from Kings Cross station). A major project in the works for quite some time, this is a complete reprint of the issues 1-10 of datacide, which originally appeared from 1997-2008. 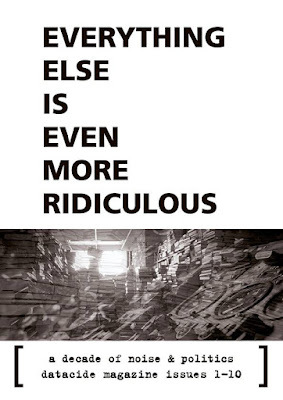 Titled “EVERYTHING ELSE IS EVEN MORE RIDICULOUS”, the 364 page volume collects unique material, most of which has been out of print for many years, charting a one-of-a-kind history of the counter-cultures associated with electronic music and free festivals. If you’re already familiar with datacide magazine and our related record label for extreme electronic music – Praxis – then you’re familiar with the efforts we’ve made over the last two decades to continually explore the intersections of radical politics and underground rave culture, experimental and extreme electronic music, moments of free spaces and momentary freak-outs and how these can be represented on the page and through the speakers. If not, this may be a good place to start. Either way, the Almanac for noise & politics 2015 contains a selection of articles and excerpts from various issues of datacide, as well as a peek into the activities of the Praxis label and its offshoots. This first edition is meant to be a brief introduction to the wide range of topics covered in datacide. Articles include: Post-Media Operators by Howard Slater/Eddie Miller/Flint Michigan, No Stars here (track -1) by TechNET, A Loop Da Loop Era – Towards an (Anti-)history of Rave by Neil Transpontine, Radical Intersections by Christoph Fringeli, Vinyl Meltdown by Alexis Wolton, Plague in this Town by Matthew Hyland, Just Say Non – Nazism, Narcissism and Boyd Rice by whomakesthenazis.com, Interview with Christoph Fringeli/Praxis Records from Objection to Procedure, a new short story by Dan Hekate, as well as a commented catalogue. This is interspersed by new visual work by Matthieu Bourel, Lynx, Sansculotte, Tóng Zhi, and Zombieflesheater! Full colour cover and 104 inside pages in A6 format!